Well, I didn't understand the gameplay of Tamagotchi World 64 in my first time of playing, because, The 2D sprites are glitchy and incorrects using Graphics HLE. So, I installed the lastest version of Project 64 2.3, and I noticed the ROM note for making a solution for the sprites to be visible. The Note says: "[HLE] Incorrect Sprites", So, I unmarked on "Graphics HLE" box, and I using the Graphics LLE with Jabo Direct3D8.dll plugin. And the sprites is working correctly, but a little slowly the frameskip. 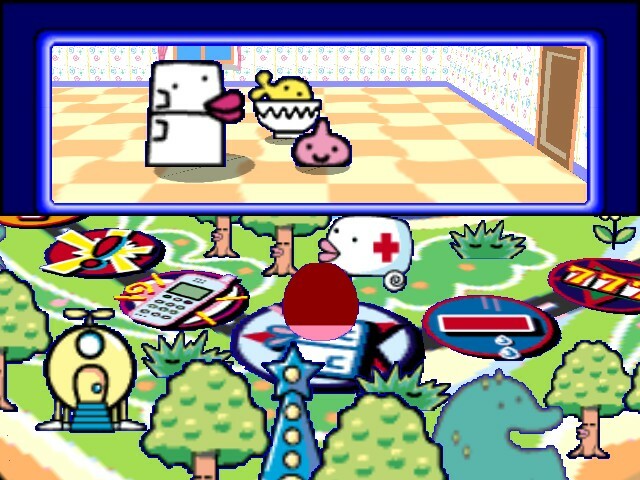 In some times playing Tamagotchi World 64, the Tamagotchi Toy token for Board Game sprite, lands over Fridgetchi spot. Fridgetchi appears, and has a glitchy problem for not giving a bowl of rice to a tamagotchi, only Fridgetchi opens his beak and closes so fast, and the game is beginning freeze! I captured the screenshots if you can see it. Someone help me to correct this freezing glitch. HLE would probably work fine if you check "Software rendering" in the advanced settings for Jabo_Direct3D8.dll. As for the freezing you can either try changing the game settings in the RDB file or test to see if it freezes with HLE enabled as well.